The former chief of scandal-hit Cambridge Analytica has refused to answer questions about the full extent of its use of Facebook-sourced data. Alexander Nix said that he could not do so while an inquiry by the Information Commissioner’s office (ICO) was live. He also accused the watchdog of “abusing his parliamentary privilege” by using details revealed at an earlier appearance as the basis to raid his firm’s offices. The BBC has contacted the ICO. But it has yet to respond. Cambridge Analytica announced it was closing in May. It became the centre of a data-sharing row after it emerged the firm had acquired data from Global Science Research (GSR), which in turn had collected millions of Facebook users’ personal details in breach of the social network’s rules. Cambridge Analytica denied any wrongdoing before its collapse and said the disputed Facebook data had been deleted in any case. Mr Nix said he stood by earlier testimony that GSR’s Facebook data had proved “fruitless”. He also denied claims by an ex-employee, Christopher Wylie, that the information was the foundation of Cambridge Analytica’s business. Instead, Mr Nix said, the “cornerstone” had been voter registration information, lifestyle data and millions of other data points that it had acquired commercially. Mr Nix first appeared before MPs in February as part of the Digital, Culture, Media and Sport Committee’s investigation into fake news. He was recalled to appear after chairman Damian Collins said there had been “serious inconsistencies” between the original testimony and evidence since received. 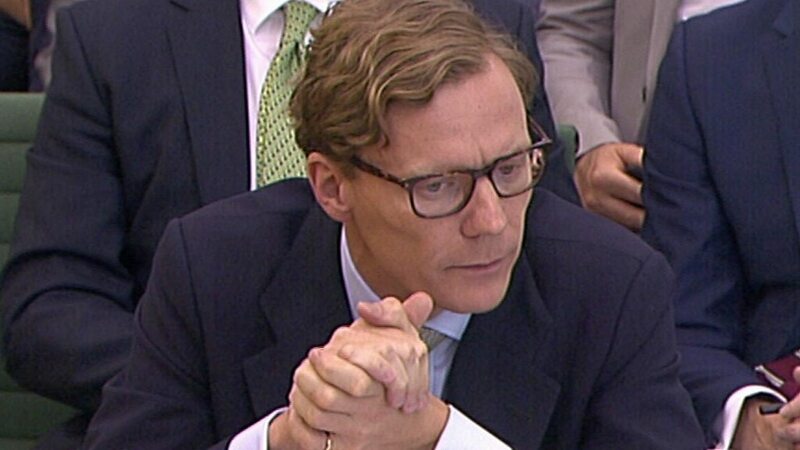 Mr Nix admitted that he had misled the committee when he had previously stated that Cambridge Analytica had not used data supplied to it by GSR, a firm set up by the University of Cambridge’s Dr Alexsandr Kogan. Mr Nix was asked whether he had previously misled the committee about GSR. “I accept some of my answers could have been clearer,” he said. He claimed that he had believed he had been asked whether Cambridge Analytica was currently using GSR’s data rather than if it had ever done so. “At that stage we had deleted all of that data,” he explained. “But, on listening back to the transcript it was clear I was asked whether we had ever been supplied with that data and my answer should have been yes. Mr Nix blamed much of the controversy on whistle-blower Mr Wylie, who he described as “bitter and jealous”. He said that Mr Wylie – who is in attendance – had been the “single source” for most of the accusations made against Cambridge Analytica. The committee’s chairman challenged this claim. The company is now in administration and Mr Nix told MPs he had invested “millions of dollars” of his personal fortune in the last few months to pay the salaries and redundancies of staff. He also said he was “deeply embarrassed” about an undercover Channel 4 News report in which he discussed questionable methods – including sending “Ukrainian girls” to a candidate’s home – that might be used to gain clients. Mr Nix said he had used “hyperbole”, admitting his claims had a “significant impact” on the firm he ran. But he claimed that the footage had been edited to misrepresent the context of his words, and that Cambridge Analytica would not have engaged in such tactics itself. The BBC has asked Channel 4 News to respond. Mr Nix also denied that two election videos made for Nigeria and Kenya, which contained what he called “unethical media content”, had anything to do with Cambridge Analytica. “I know the media wants to see us as this nefarious multi-national that influences politics around the world but the truth is that we are a very small advertising agency that works across a series of sectors,” he said. He added that political work had made up just 25% of what his firm had done. Towards the end of the session, Mr Nix became emotional, accusing the committee of believing “conspiracy theories” and making “sweeping assumptions”. He said that he felt “victimised” by their questioning and the media furore that had engulfed him in the last few months. And he claimed that his firm had been victim of an effort to force a second Brexit referendum by what he said were false claims that it had been involved in the first one. Carole Cadwalladr – the journalist that worked on the Observer investigation that helped cause Cambridge Analytica’s downfall – mocked this allegation on Twitter.